What would you do if you suddenly woke up, with no memories of who you are or where you come from? If the only thing around was a disembodied voice telling truths you don’t want to believe? Then welcome to the world of Awaken. Awaken is a video game developed by Tesseractive Games, a team of fourth year Interactive Arts and Science students at Brock University. 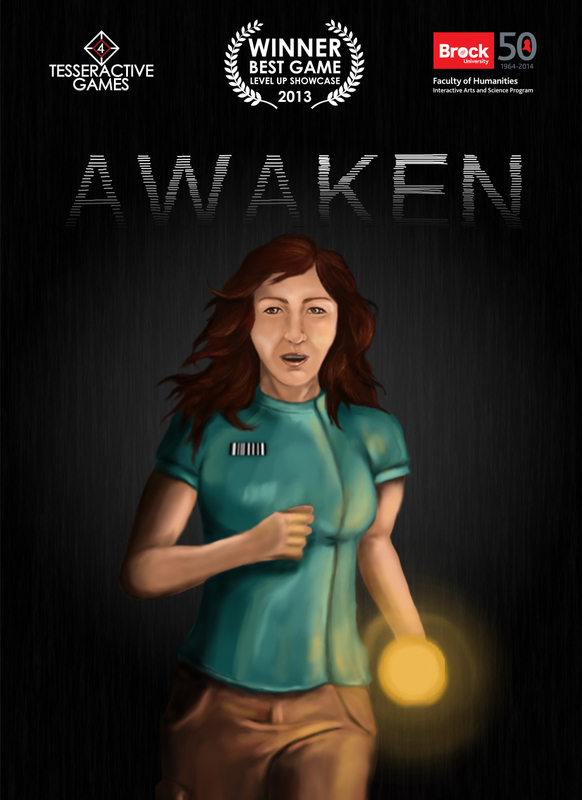 In Awaken, players assume the role of Hope Richmond. As Hope, players start out with no memory of who they are, or what is happening around them. With only a disembodied voice to guide them, players must explore their surroundings to learn more about why they are trapped in their current situation. Unlike previous games created by Brock students, Awaken is not focused on action, but rather on environment exploration and character development. Players are encouraged to progress through the game at their own pace, and fully explore the world of Hope has found herself in. Awaken also supports an in-depth dialogue system between Hope, and the mysterious voice that guides here along her journey. Players can choose how they want to respond to certain situations, and develop Hope as the character they want her to be. Everything in Awaken is also 100% original work. This includes all models, environments, textures, audio cues, dialogue, and cinematics. Our goal with this project was to create an original game from the ground up. All of this and more await you inside the world of Awaken. We welcome you to come and play our game, and experience the world that we have created. On April 3, The Design Exchange at 234 Bay St. in Toronto will be hosting the Level Up Gaming Showcase. This unique event will grant student game developers in various college and university programs — such as design, animation and computer science — the opportunity to show off their skills in game design to video game industry professionals. Steve Engels, Co-Organizer of Level Up and Senior Lecturer of Computer Science at the University of Toronto, described the event’s origin. “It started out six years ago as something that I was doing for my class. And, at the end, to give my students sort of an incentive to make games that work, we had this expectation that the last milestone would be that they would have to set their games up and we’d invite all sorts of university people to come by and try to play out their games,” said Engels. Engels said the purpose of Level Up lies within a three-pronged paradigm. Engels said that a wide variety of video game industry professionals will be in attendance, which will grant the students a chance to display their work and perhaps land that dream job. Jean Bridge, Associate Professor in the Visual Arts program at Brock University and advocate for her students’ involvement in Level Up, said that it is with great pride that she sees her students participate in such an event. Bridge said that when Brock learned about the showcase and brought it to the attention of the students, they asked if the students felt they were ready for this event. Kevin Greene, Brock student and Game Developer for the game they are showcasing entitled Awaken, explained what the game is all about. “Awaken is a first-person, puzzle and exploration game. You wake up in a bedroom with no memory of who you are or why you’re there, and you have this mysterious voice who speaks to you. You have to try to figure out why you’re in this house and try to escape it,” said Greene adding that they borrowed a lot of their influence for the game from the 2007, puzzle-heavy release: Portal. Greene said that Awaken was developed based on the knowledge they have gained from theory courses in their program and that they wanted to create a game heavily based on narrative. For more information, visit levelupshowcase.com. Article by The Sheridan Sun talking about the 2013 Level Up Showcase in Toronto, ON. Article by Niagara This Week about Awaken winning 'Best Game' at the Level Up Showcase at the Design Exchange in Toronto, ON. Article by Brock News about Awaken winning 'Best Game' at the Level Up Showcase at the Design Exchange in Toronto, ON. I really enjoyed this, it was nicely done. We are not continuing Awaken. It was a class project for us last year and we've all graduated from the program and are working on other things (more schooling, work, etc!). To keep the scope of our project reasonable we aimed to create a level that was intended as the intro/tutorial level for a larger game. Apparently we were successful! Keep your eyes peeled as the current graduating class has begun production on their game and if we remember we might post the info here, and also on our Facebook page. Glad you enjoyed the game! So, all the best for all of You! Stay creative! Thanks for playing and glad you enjoyed it! It isn't meant to be a horror game but it does have some spooky elements to it. We really enjoyed watching your playthrough of it and have featured it on our Facebook page (www.facebook.com/awakengame). There's even a hint in the comments that might help you finish the game! Could you please include the system requirements? Just in case. I've added the system requirements in the description of the download.